An experimental unmanned aircraft developed for the U.S. Air Force has flown at more than five times the speed of sound in a test off California. The WaveRider was released Wednesday from a B-52 bomber 50,000 feet above the Pacific and was initially accelerated by a rocket before the scramjet kicked in. The flight ended with a planned plunge into the ocean. It was the fourth and final flight of an X-51A by the Air Force, which is studying ways to deliver strikes around the globe within minutes. Previous flights ended in failure or didn't reach the intended speed. 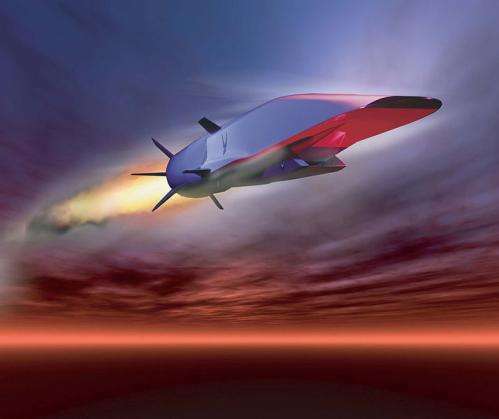 Congratulations you just made a hypersonic air launched cruise missile. By the time you've got the B52 out the hanger then proceeded up to 50,000ft you may as well have launched a conventional missile. Although mach 5 is bloody fast. Isnt that some kind of record? fastest man made object flown in the atmosphere that wasn't re-entering from space. edit: nope the X15 still holds that one. 4500mph! I think the point is an ICBM launch would be detected and upset the Russians and Chinese and maybe cause World War 3. But this "missile" is an "unmanned aircraft" :Fine distinction there guys. Isn't all this money that Americans are spending in their plans to commit further acts of mass murder, better spent elsewhere? Escape velocity is Mach 34. Keep trying boys. Sweet. Would be cool if the tech trickles down to commercial flight somehow. Hopefully within the next 50-60 years or so before I die. So they are busy wasting millions of your tax dollars creating something that is slower than what they built 50 years ago??. I could save your military A LOT of money. oh & whats 15 backwards, ........ 51. ahum. It isn't ideal but the world isn't ideal either. Mass murder has been going on since man was tribal in Africa. I like to wonder what the world would have become if America had stayed out of WWII. Would Hitler have developed atomic weapons and taken over everything and "cleansed" the world of anyone not fair skinned and round eyed and brought "peace" to the world? Probably not, feudal Japan fought themselves all the time. China continues to this day with decades long cultural cleansing and it has little to do with race. Their great leap forward wiped out 35 million or more. So probably were in a quiet period right now before the next round of serious mass murder. Maybe we will hit the next power of ten, 100s of millions! Well has anyone heard of an arms race?? Been going on since cave man days. Most life forms do it, it's a driving force of evolution. If everyone is doing it, then I'd rather live in a country that does it well, and stays infront of any potential enemy. Ohhh and don't forget tech spin offs too. I would imagine that when this technology is ready they won't be launching them from planes (unless high altitude thin air is required? ).